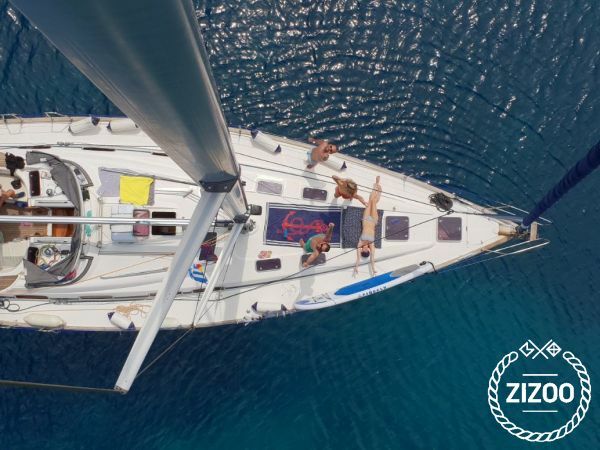 Our recently refurbished (2019) and very well- maintained yacht is available for bareboat or skippered charters upon request. One of Bavaria's best sellers, it combines a sleek design with ample space and can provide comfortable accomodation for 8+2 persons and a premium sailing experience. It is equipped with more than the standard inventory and safety equipment, fully conforming to Hellenic Assosiation standards. It can accommodate up to 10 people and in 4 cabins and a convertible saloon table. There are 2 WCs, 1 electrically operated & 1 manual, and 2+1 showers. The yacht is equipped with Ipad with Navionics, colour GPS Chart plotter, Tridata (depth, speed, sea temp. ), Wind speed, Windex, Compasses, Sea charts, Greek Waters Pilot (new edition), Barometer, Binoculars, Hand sighting compass, Flags QNC, List of lights, Solar panels,TV with USB, RADIO/CD/MP3 with USB & AUX output, On board you will also find all the necessary safety equipment like: Life raft, GMDSS, EPIRB, Life jackets, Safety harnesses, Horseshoe buoys, Floating life light, Box of flares, Fire extiguishers & Fire blanket, First aid kit, Emergency tiller, Sea anchor, Bosuns chair, Navigation lights, Radar reflector. We are located in the coastal port city of Volos, central Greece, which is the ideal outlet of the whole region for anyone who wants to enjoy the breathtaking beauty of Pagasitikos Gulf,the beaches and isles of Mt.Pelion, Sporades Islands, Nothern Evia and the Nothern Aegean Sea. Our main base is Volos but the yacht is also available for check-in/check-out at any of the Sporades islands ports, upon request.